We will undertake a private charter to Madang and the Sepik River. We welcomed two families for the Milne Bay Cruise. The group boarded the Kalibobo Spirit in Alotau, we immediately left and travelled to Waga Waga Mission Station where the group enjoyed a swim, a good sleep before beginning their cruise through the Milne Bay Province. The cruise began in earnest on Saturday with a voyage across Milne Bay, past East Cape and across the Goshen Strait to Sewa Bay where they enjoyed their first dive. In the afternoon we cruised to Dobu between Normanby and Fergusson Island where a further dive was made and two snorkelled over the volcanic vents off the northern end of Dobu Island. Late in the afternoon a walk to Dei Dei to witness the hot springs arriving back in the dark. Early in the morning, the Kalibobo Spirit travelled through the Dobu Passage and out into the Solomon Sea to visit Egum Atoll and the village of Yaneba, following a visit to the village, an excellent dive off the western side of the Island. Seas did not permit a dive at Quark Rock and we continued onto Gawa in the Marshall Bennett Group, on arrival a dive, snorkel and Shelly walked up the limestone track with members of the crew. The following morning we went ashore and met Tobu who explained the method of making a Kula Canoe after which we departed for Kitava, the first Island in the Trobriand Group. On arrival we moored the Kalibobo Spirit between Naratu Island and Kitava which is protected from the SE winds. A walk into Kamegawea Village, inspection of the Community School and an exchange of gifts. 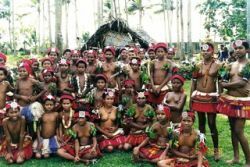 In the evening, we had a visit from the youths with a string band and ladies in traditional Trobriand Dress who encouraged us all to get up and dance. The next morning, we left early to arrive in the morning at Kaibola Village on Kiriwina Island. The guests went ashore where the Community School had arranged a welcome with dances by the students. A visit to the village, followed by a dive and snorkel. During lunch a short cruise across to Kuduaga Village. The following morning, we sailed across to Kywawa Island and Village, an inspection of the school a further exchange of gifts then back to the Kalibobo Spirit for two excellent dives and a few hundred lobster bought in by the locals. In the afternoon another dive, then departure through a narrow channel towards the Amphlette Islands. On arrival at Urisi Island in the Amplette, we dropped anchor in the dark to awaken the next morning to a superb sunny day, top class diving in what was described as an aquarium. Later in the day, we sailed along a narrow channel to Wagifa, a small islands off the SE coast of Goodenough Island in the D'Entrecastreaux Group of Islands. On arrival everyone climbed the 400m hill to gain panoramic views of the Moresby Passage and a visit to the village set amongst a landscaped of stone gardens. The final full day started with a another dive, then during lunch sail across the Goshen Strait to East Cape where we snorkelled as it was too late for diving due to the departure the following day. In the late afternoon, we continued through the Eastcape channel into Milne Bay and down to Waga Waga for the last night dinner with entertainmnent by both the crew who sang as we enjoyed as farewell meal with all the off duty crew. Final day, we accompanied the two families for their flight back to Australia. 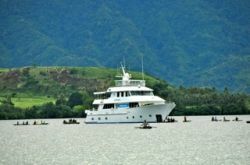 Perfect weather provided for a special 3 day cruise to Kar Kar and Bagabag Islands for a private charter organised by 'Bertie Henwood' and her band of nine tennis friends aband known as the "Tsunami Group'. Each yeat this group choose a different destination and this year they chose Madang Resort and the Kalibobo Spirit. 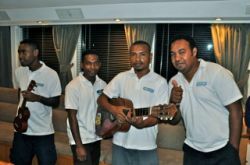 They arrived on June 11 for 6 days, but after they arrived, extended their stay an additional two days to see more of Madang and enjoy the fine facilities aboard the Kalibobo Spirit and the Madang Resort. Their cruise visited the volcanic island if Kar Kar with a population of 70,000 people and Bagabag with a population of a mere 3,000. Both Island are volcanic orgin, entirely difference and offer superb cultural activities in villages, excellent scuba diving, snorkelling, swimming with both black and white sand beaches. The Tsunami Group visited Biabi Plantation where they inspected an excellent collection of silverware and paintings collected by the owner at his plantation house, they also visited the copra and cocoa sheds to learn more about coconuts and cocoa that provides the islands their main economy. A visit to the 150 bed Gaubin Hospital run by tLutheran Health Services and Kurum Village whilst the crew went out in the Companies Game Boat and caught 4 large mackeral simultaenously on 4 lines! At Bagabag they visited a community school, swam on white sand beaches, snorkel and dived in crystal clear waters off Christmas Bay and in the late afternoon went fishing. The highlight of the cruise was when a large school of pod whales and hundreds of dolphins swam around the Kalibobo Spirit performing marvellous feats seemingly for the Tsunami Group. Ben & Shelly Chigier chartered the Kalibobo Spirit in June and undertook a 7 day cruise to the Sepik, Boisa, Kar Kar & Bagabag. Boisa was their favourite destination where they were entertained by the children at the small island school, and the children were then entertained by the Chigier's. Diving at Boisa was superb. The Chigier's wer so impressed with Boisa they decided to donate funds to cover outstanding school fees and provide solar lighting, school books which at the time of writing is in progress. albiet r ather slow. Kylie and Angela along with their family of 11 have the Kalibobo Spirit currently chartered in East New Britain and New Ireland. Their cruise will terminate in Kavieng on Sep 26 when they return to Australia and we ferry the Kalibobo Spirit to Madang. Read about their travel on the Kalibobo Log on this website. On Sep 29 the Kalibobo Spirit will depart Madang for Cairns, arriving on about Oct 4 for annual survey. We expect the vessel to return to Madang in mid-October. Our crew is waiting to welcome you aboard the Kalibobo Spirit! !